Utilizing campus as a living-learning lab, our internship program enlists students as researchers in investigating important questions facing our community. 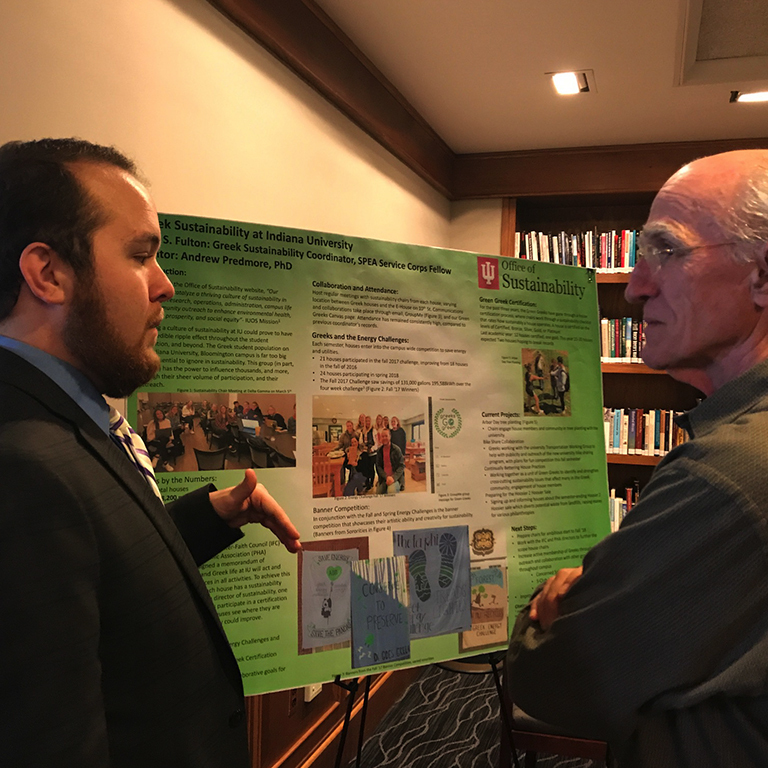 Co-mentored by staff in operations and faculty members, students conduct research and develop programming focused on general sustainability outreach and education or in specific topic areas aligned through IU's commitment to sustainability. Interns work 12-15 hours/week during the academic year and around 20 hours/week in the summer, and participate in a weekly seminar designed to provide students a background in sustainability and a forum for collaborating. This helps us connect Hoosiers to the environment and each other, fostering a commitment to service, cultivating lasting friendships and a connection to broader sustainability initiatives. Interns are high achieving and actively involved students who hail from all academic departments, and serve in various capacities to sustain IU. While supporting research and teaching, sustainability's most direct contribution, when it comes to academics, is to give students opportunities to apply what they are learning in the classroom to the real world, whether on or off campus. The heart of this is our internship program, is using the campus as a learning lab, where our students lead change in the areas of transportation, energy, food, recycling, and more. The Campus Garden and Farm Intern will coordinate IU student involvement with the engagement and production needs of two campus spaces: The Campus Garden located at Hilltop Garden (near Tulip Tree Apartments) and The Campus Farm (at the Hinkle Garton Farmstead on 10th Street). The intern will concentrate efforts on volunteer recruitment and training, class recruitment for tours or service learning, marketing and events, mentoring new gardeners in the Rent a Plot program, general farm/garden labor including planting and harvesting, and attendance at necessary meetings. The Garden and Farm intern will help bridge student academic interests and initiatives with crop production and food consumption needs, and work with members of the Food Working Group to promote sustainable food consumption to students, and with members of IU Dining to develop a clear and effective grower-to-buyer relationship. Hours are dependent on specific weekly needs, including day, evening, and weekend hours, though largely flexible with the applicant's availability. Successful applicants will be able to transport themselves to the Garden and Farm via bus or vehicle, be comfortable leading tours or training, and be excited and willing to complete production labor at the farm or garden, usually in warm weather. This intern will be co-mentored by faculty co-chair James Farmer, Farm Manager, staff co-chair Lea Woodard, Hilltop Garden Manager, and Makayla Bonney, Assistant Director of Sustainability at Sustain IU. This position works across commitment areas within Sustain IU to strengthen the brand through the development of written, visual, and graphic content to promote campus sustainability efforts. This intern will create and maintain a social media strategic plan, take and edit photos, create graphics for the web and print, and develop/curate content for the Sustain IU newsletter to highlight current events and initiatives. Attendance at involvement fairs, resource fairs, and other events is an important part of this work, and may require occasional evening and weekend work. Strong journalism, creative writing, or graphic design background required. Experience using Adobe Creative Suite, strong graphic design skills, photography skills, attention to detail and grammatical accuracy required. This intern will be mentored by Ashlee Wilson Fujawa, Sustainability Specialist at Sustain IU. This intern will work with the Energy and the Built Environment Working Group to assist in strategic planning and tracking IU's progress toward its energy goals as called for in the Bicentennial Strategic Plan. Work will include an ongoing assessment of the Integrated Energy Master Plan, evaluating data related to energy use, greenhouse gas emissions, and utility costs. This intern will assist in facilitating the Energy and the Built Environment Working Group, including leading meetings, assisting with new member recruitment and retention, providing research support, and supporting programming and implementation of energy efficiency measures. Additional projects could include researching the energy consumption of ultra-low temperature freezers in University labs. Successful applicants will have a basic understanding or interest in energy systems, work well autonomously, and have an interest in learning research concepts. This intern will be co-mentored by faculty co-chair Chip Glaholt, SPEA Adjunct Faculty, staff co-chair Mark Menefee, Assistant Director - Utility Operations Division, and Makayla Bonney, Assistant Director of Sustainability at Sustain IU. This student will work to engage various campus members in daily sustainability work, in an effort to improve the culture of campus sustainability in a collaborative way. The intern will be responsible for promoting the Green Events program, and engaging faculty-staff Green Teams in important Sustain IU efforts, like the Energy Challenges. This intern will also serve as a liaison for various student groups, including Greek organizations and Student Affairs. Attendance at involvement fairs, resource fairs, and other events is an important part of this work, and may require occasional evening and weekend work. This position is responsible for engaging a wide variety of groups, so applicants must be driven, an effective communicator, and comfortable in a variety of social settings. Successful applicants will enjoy collaboration, be comfortable with public speaking, be highly organized, self-starters, and experienced with document management and record keeping, as well as event management. This intern's work will be focused in the following areas: leading working group meetings, focused on updating the Sustainable Landscape Management plan; advancing work related to the plan, including the use of compost on the landscape, the use of non-potable water for irrigation, and and mapping herbicide/fungicide use on campus; and, leading the effort to update IU's geographic information systems (GIS) tree inventory. Ideal candidates will have a passion for urban ecology, excellent collaborative skills, and interest and ability in applying GIS skills to campus landscape management. This intern will be co-mentored by faculty co-chair Melissa Laney, SPEA Senior Lecturer, staff co-chair Mike Girvin, Assistant Director of Landscape Services, and Andrew Predmore, Director of Sustainability at Sustain IU. The Office of First Year Experience Programs (FYE) and Residential Program Services (RPS) serve nearly 8,000 new students each year. Both organizations are working to integrate sustainability into their operations and programming. This intern will create and implement sustainability programming targeting FYE students; leverage opportunities through collaboration with RPS and RHA; work closely with Eco Reps to connect them to Sustain IU efforts. Attendance at involvement fairs, resource fairs, and other events is an important part of this work, and may require occasional evening and weekend work. Ideal candidates should have strong interpersonal skills, excellent project management abilities, and a passion for improving sustainability culture at IU. NOTE: Interview team will prioritize applicants sophomores that plan to live on campus. This intern will be a catalyst and unifier for diverse campus groups working towards the IU Real Food Challenge; tracking and assessing Local, Ecological, Humane, Fair and Disqualified foods purchased on the Bloomington campus. The student will lead and facilitate the Food Working Group, partnering with IU Dining, Healthy IU, the student Health Center, and the Food Institute. 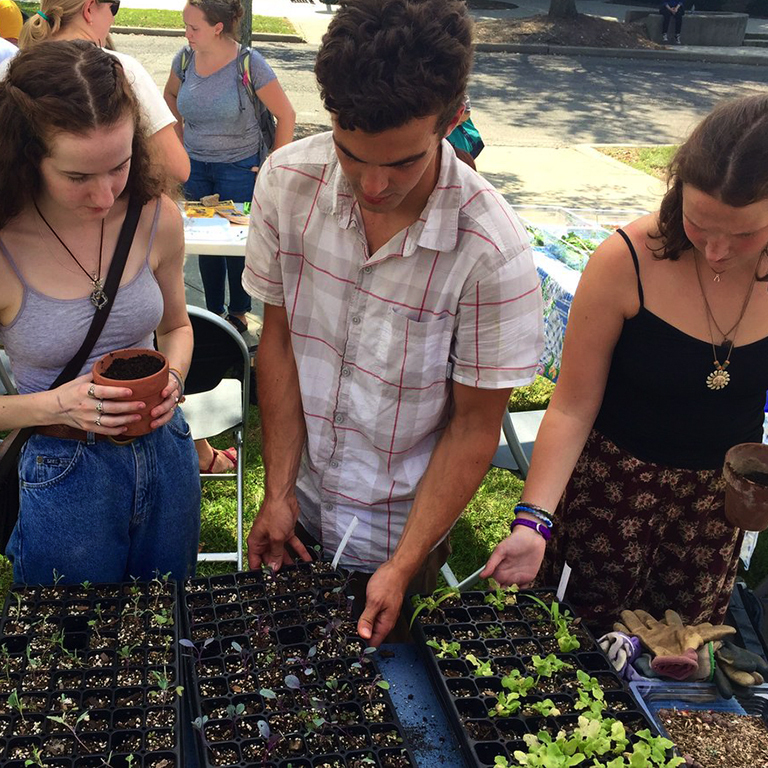 In the summer and fall, the student's time will focus on spreading engagement in sustainable food, including planning and executing BREG (Big Red Eats Green), and annual sustainable food fair that showcases Real Food vendors in IU Dining. In the late fall and spring semesters, this student will assess and communicate data concerning Real Food procurement from the previous year. Ideal candidates will be excellent collaborators, have passion and knowledge of sustainable food systems, and have interest in tracking progress towards IU's Real Food goals. This intern will be co-mentored by faculty co-chair Carl Ipsen, Food Institute Director and History Faculty, staff co-chair Steven Lalevich, IU Health Registered Dietitian, and Makayla Bonney, Assistant Director of Sustainability at Sustain IU. This intern will work to continue improving and developing programs to reduce the waste stream, improve reuse programs and services, and improve the recycling and compost infrastructure on campus, through education, training, infrastructure, and planning. The intern will also use the results from the Working Group’s campus-wide waste characterization assessment to draft a sustainable materials management plan. In addition to assessing the 2018/2019 waste characterization assessment, the intern also helps facilitate the Resource Use and Recycling Working Group, including leading meetings, recruiting new members, and supporting programming originating in the working group. This intern may partner with other interns on Green Events, Greening Cream and Crimson (Athletics) programs, and the Food Working Group on increasing waste diversion and reduction on campus, towards the 2020 goal of 50% diversion and 10% reduction per person. A successful applicant will be organized, a self-starter, and able to communicate with a wide range of people, including occasional student engagement events. This intern will be co-mentored by faculty co-chair Kelly Eskew, Kelley School of Business faculty, staff co-chair Tom Fallwell, Building Services Area Coordinator, and Makayla Bonney, Assistant Director of Sustainability at Sustain IU. Over the past few years, the Sustainable Technology and Procurement Working Group has extended its reach from department-oriented projects (printing, e-waste and power use) to more University Administration and student move-in focused issues. Our goal for this coming year is to explore ways to intervene in IU’s supply chain with ecological, just, and economical solutions to IU’s day-to-day product needs. This may include garnering administrative support for sustainable procurement, investigating end-user interventions, exploring contract negotiations for sustainable purchasing, and effective project management and planning support for all items listed above. This intern will be responsible for setting Working Group meeting agendas with the group’s co-chairs, leading monthly meetings, and tracking progress in a work plan. Additional responsibilities might include helping to organize public events such as documentary film screenings and investigating procurement incentives for Green Lab equipment. Ideal candidates will be strong communicators, have strong project management skills. Students with interest and growing expertise in sustainable business are encouraged to apply. This intern will be co-mentored by staff co-chair Noma Maier, UITS Sustainable IT Project Manager, and Makayla Bonney, Assistant Director of Sustainability at Sustain IU. This intern will work across commitment areas to increase participation in sustainability on campus, focused on short and long term behavior change initiatives. This intern will work alongside the Energy and Built Environment working group and the Utility information group to increase water and energy conservation on the IUB campus through coordination of a campus-wide Energy Challenge. Duties will include examining data for trends and inconsistencies, assisting in the creation of communication and engagement materials related to behavior programming, tabling at events, and other duties as assigned. This intern will develop expertise in behavior change campaigns and may have opportunities to apply those skills in other areas like waste minimization. Ideal candidates will have excellent interpersonal skills, a strong interest in behavior change and communications, and a passion to create measurable progress in sustainability. The Sustainable Transportation intern will assist in leading and facilitating the Transportation Working Group meetings. The student will assist faculty, Fleet Services, and Sustain IU mentors to identify and implement opportunities to promote active transportation to faculty, staff, and students. The student will assist in analysis of the Transportation Commute Modal Split which will be deployed to campus members in fall 2019. A successful applicant will be organized, have some experience in social sciences and survey creation, and able to critically assess social behavior data. This student will liaise with Healthy IU, Parking, and may engage with Campus Commute, alternative vehicle procurement in Campus Fleet, and active transportation marketing and communications. This intern will be co-mentored by faculty co-chair Julie Hardesty, IU Libraries Metadata Analyst, staff co-chair Amanda Wilson, Director of Fleet Services, and Andrew Predmore, Director of Sustainability at Sustain IU. 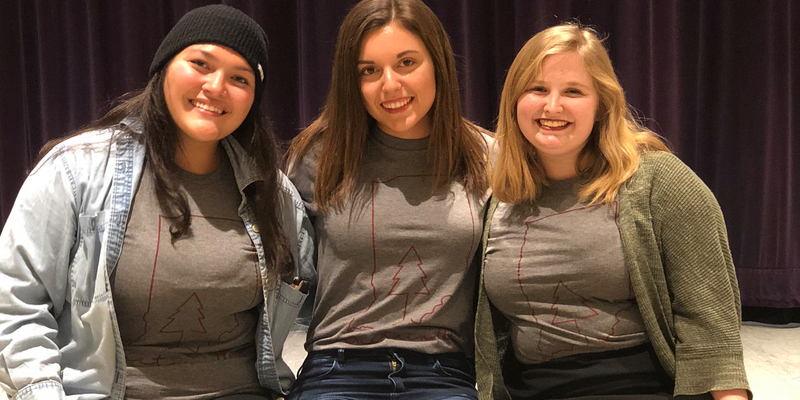 This year marks the seventh Hoosier to Hoosier Community Sale, an effort which in 2018 collected 60 tons of reusable items from IUB residence halls, Greek houses and off campus properties. The sale of these items back to the community raised over $40,000 for local nonprofits and sustainability efforts at the City of Bloomington Department of Economic and Sustainable Development and the IU campus. This internship will build on the previous academic year intern's work, with the goals of: (1) avoiding or diverting more reusable items before they enter the waste stream, and (2) increasing and diversifying sale volunteers through volunteer recruitment and training. Applicants should be energetic, self-starters, organized, and good at leading volunteers. This position needs to have a very open and flexible schedule, with availability of ~20 hours each week throughout the summer preferred, the most competitive applicants will not have competing schedule demands in the summer such as a second job or summer classes (short-term classes might be accepted). In the fall semester, the student will work less hours and all hours will be dependent on applicant's availability. Timeline for student work is: Summer semester; planning and preparing for sale; Fall semester; data and budget analysis from 2019 sale; Spring 2020 organizing files and suggesting changes for 2020 sale, assisting in marketing and planning of 2020 H2H sale and assisting with training the next H2H intern. NOTE: Interview team will prioritize applicants with availability to begin in April 2019. IU Landscape Services manages IU's beautiful woodland campus. The IU geographic information systems (GIS) Tree Inventory is a collaboration between the Landscape Services and Sustain IU and was first completed in the summer of 2016; the campus is now scheduled for re-inventory this summer. To complete the re-inventory, Landscape Services is looking for TWO upper-level undergraduates or graduate students to help re-inventory the trees for campus. Preference will be given to candidates with a GIS background and experience identifying tree species. Ideal candidates must be willing/able to work outdoors and pay close attention to detail to ensure data quality. There is the potential for both students to work up to 40 hours/week. Though not technically a part of the Sustain IU internship program, the selected candidates will have the opportunity to collaborate with interns and with the Environmental Quality and Land use working group. The selected students will be report directly to Mike Girvin, Assistant Director of Landscape Services and Horticulture Supervisor, Tristan Johnson. Interns work 12-15 hours/week during the academic year and around 20 hours/week in the summer, and participate in a weekly seminar designed to provide students a background in sustainability and a forum for collaborating. This helps us connect Hoosiers to the environment and each other, fostering a commitment to service, cultivating lasting friendships and a connecting to broader sustainability iniaitives. Interns are compensated for their time at a rate of $15/hr for graduate students and $12/hr for undergraduate students. Applicants must be full-time students at Indiana University Bloomington, with a minimum GPA of 3.0.